What is a Spawning Channel? Artificial spawning channels are built adjacent to salmon rivers, directing a controlled flow of water over extensive gravel spawning beds. The rate of flow and water depth is set to create ideal spawning conditions. Salmon spawn naturally in spawning channels. Studies have shown that egg-to-fry survival rates can increase 10 fold in spawning channels as compared to survival in the adjacent, natural stream. The serpentine channels are not exposed to the seasonal floods that can wash away and kill salmon eggs in the natural river. But without floods to flush the gravel clean, sediment builds up eventually smothering the spawning beds. Spawning channels have to be cleaned every few years by crews that use heavy equipment to scoop up dirty gravel and "cast" it over the bottom, dislodging sediment, which is washed away. Dirty water created in the cleaning process is pumped away from the channels so as not to settle farther downstream. 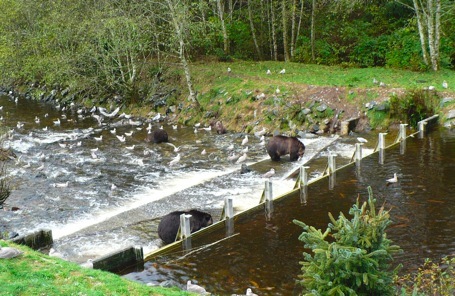 Spawning channels attract bears during the fall, because the salmon are easily caught in the shallow waters and steady currents. That phenomenon has led to the creation of bear tourism businesses in B.C. and most spawning channels now have bear viewing platforms on them.